SWIND EB-01 is the ultimate toy for the urban adventurer and cross-country adrenalin junkie. £15k bicycle boosts pedal power with 15kW electric motor, delivering speeds of over 60mph (100km/h) and 80 miles (130km) of range. 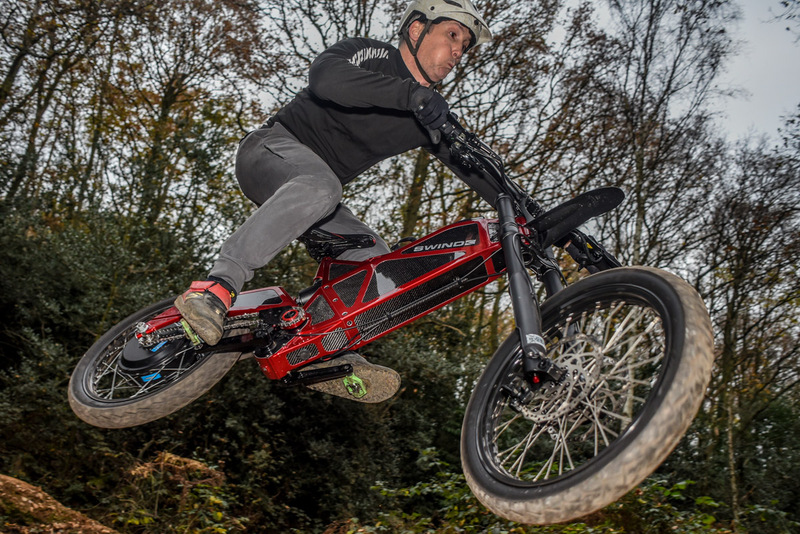 Innovative and premium quality lightweight chassis, full suspension and choice of wheels and tyres allow riders to cross mountain ranges, perform tricks and race around tarmac bends. Propelling the bicycle at an electronically limited speed of sixty miles-per-hour, the near-silent 15kW electric motor sits within an innovative hybrid aluminium and carbon-shell frame, which is designed primarily for function but is rakishly eye-catching. The materials were chosen for stiffness, lightweight and mechanical resilience and to add to the performance are pedals and regenerative brakes with twin front discs. The battery is a 1.75kwh lithium-ion power pack with intra-cell forced air cooling, delivering the most phenomenal electrical thrust ever harnessed to a bicycle. SWIND EB-01 has an electric range up to 80 miles, and takes under 90 minutes to fully charge. It has three power settings: Eco, Normal and, for the brave, Boost. With pedal power, the rider can add an exercise regime like a normal bicycle – they will just cover a lot more ground than usual. The EB-01’s 9-speed sequential gearbox is fully integrated into the frame delivering instant and silky smooth shifts regardless of the terrain, load, and power setting. The drivetrain is fully enclosed, maintenance free and as reliable as a Swiss watch. Priced at £15,000 plus local taxes, it’s a toy for the imaginative, unhinged and well-resourced. It comes in six primary colours and bespoke designs are available. This highly-advanced two-wheeler has been developed and manufactured by Swindon Powertrain, a UK tech company normally focused on top secret prototypes for supercar OEMs. The EB-01 is the first in a range of state-of-the-art and eco-minded consumer products to emerge from the company’s engineering lab.